Boys & Girls Clubs of America (BGCA) launched a new Alumni & Friends Club today to engage its estimated 16 million alumni as “advocates and ambassadors” for current Club Kids. Alongside celebrities such as Shaquille O’Neal and Jennifer Lopez, a major activation strategy in the effort is the organization’s impressive list of corporate supporters. Over 50 partners will activate both internal and external recruitment campaigns led by president and CEO of Dr Pepper Snapple Group Larry Young and his wife Colette, official co-chairs of the initiative. Initial Alumni & Friends Club memberships are free and a “perks” membership is being sold for $50.00, providing $4,500 in discounts on items such as tires, movie tickets and pizza. Several corporate partners are offering expanded discounts as part of the program and Royal-Pascoe anticipates more joining in the future. 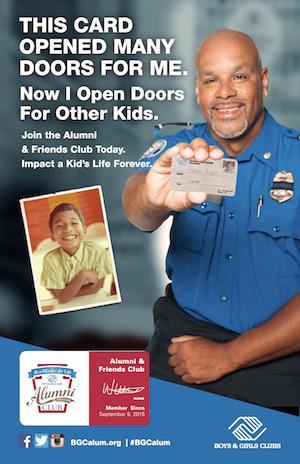 Activating their enormous alumni community via this national campaign makes perfect sense for BGCA. Leaning on corporate partners to pave the way ensures not only their partners’ understanding of the potential power of this community but their continued interest and investment.